According to the India Brand Equity Foundation, the size of the Indian consumer durables market amounted to INR 1.4 trillion (USD 21.70 billion) in the financial year 2017 (April 2016-March 2017). The implementation of a nationwide Goods and Service Tax (GST) in July 2017 created some ambiguity in the tax structure, resulting in lower revenue growth in Q3 of 2017, but caused no major payment delays. GST on consumer durables (appliances and consumer electronic products are considered in the luxury category) is at 28%, which caused a low sales increase even during the festival season. However, the industry is expecting a reduction of the GST rate to 18% which, if implemented, will boost demand in 2018. About two-thirds of Indian retail revenues are generated from urban areas, fueled by rising disposable income, easy financing and the growing popularity of e-commerce platforms. The rural market of around 800 million people accounts for nearly 40% of the sales of all branded products in daily use. 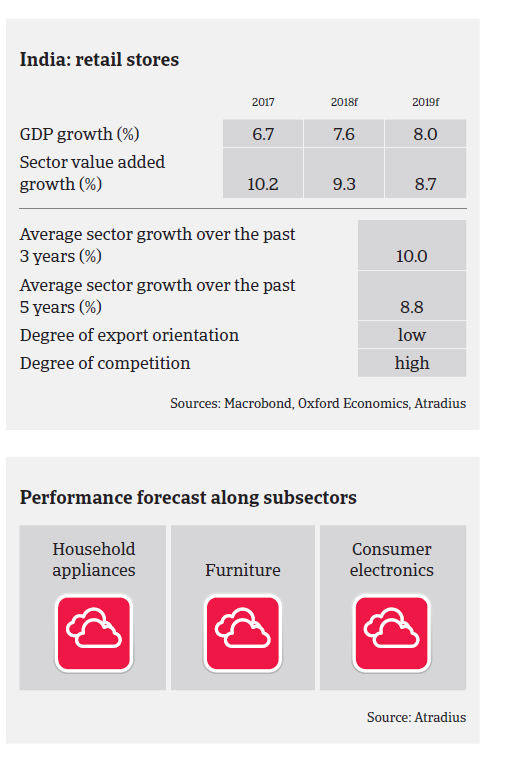 As a large part of government spending is aimed at bolstering rural development and providing higher income for farmers, this is positive for the consumer durables industry. Due to the “Make in India” government programme many domestic and Chinese manufactures are investing in India to set up their manufacturing plants. In December 2017 the government hiked import duties on smartphones, television sets, microwaves, LED lamps and some other electronic items in a bid to protect domestic manufacturers. Overall, businesses’ profit margins are expected to moderate in 2018 due to growing competition and the rising market share of e-commerce. Indian consumers continue to be very price sensitive, with sales prices remaining the primary decision factor for purchase. Payment terms are 60 to 90 days on average. In general the payment experience in this segment remains satisfactory, with any reported payment delays mainly notified in the small distributors segment. Our underwriting approach is generally open for large consumer durables manufacturers and retail chains which are financially sound or part of larger groups. However, we maintain a more prudent approach on small and medium-sized retailers, as those generally operate on low margins and are impacted by multiple sourcing, tougher competition and price volatility. We maintain a cautious approach on highly leveraged businesses in this segment. While many e-commerce retailers are scaling up and investing heavily in operations, they also continue to report significant losses due to heavy discounting.